THEE ELECTRIC BASTARDS on CHROME PEELER REC. Featuring members of CLOUDS, OCTAVE MUSEUM, HYDRONAUT and PET GENIUS, and produced by Stephen Brodsky of CAVE IN and NEW IDEA SOCIETY, "Live! 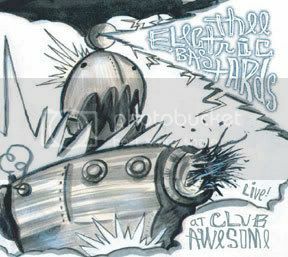 At Club Awesome" is a 11-song STUDIO recording of the band playing live at their rehearsal space. Boston's Thee Electric Bastards, whose expansive psych-pop falls somewhere in among Syd Barrett era Pink Floyd, the Zeppelin end of the White Stripes catalogue (but only if it was scored by an Elephant Six band), and Yoshimi-type Flaming Lips. And if that seems like an awful lot of territory, well, they cover a hell of a lot of it. With songs about futuristic life (Robots Do Not Rock) blatant machismo (The Peepin' Song, Play The Fool), alcoholism and mental health (Millennium Blues, Black Jets), The Bastards have allowed the listener a peek into their sordid little world, where society's ills and fears are celebrated. All of The Bastards songs are well crafted slices of weirdness, with compelling breaks in the music that are sometimes jarring in effect. It harkens back to the days when rock music was more experimental, and less formulaic.